The hardworking staff knows as well as anyone that everything is for sale to marketers these days (see Michael J. Sandel’s definitive 2012 Atlantic piece here), but this ad in last Friday’s Wall Street Journal kind of took us aback. 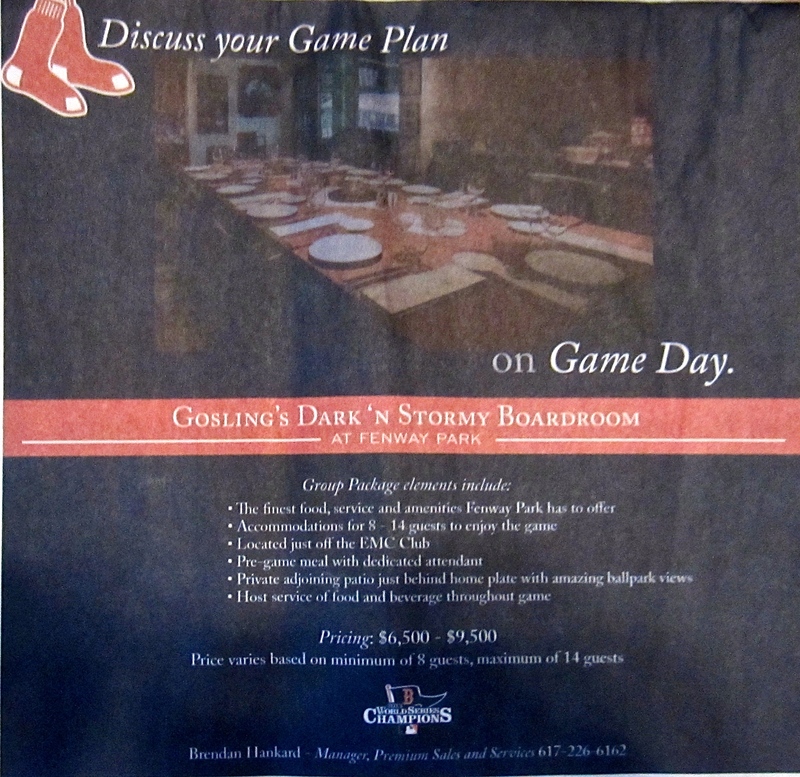 First off, do you really want your board meeting to be Dark ‘n Stormy? Second off, is there any part of John Updike’s lyric little bandbox that isn’t for sale now? Third off, does it have to be sold to a liquor company? We’ll be calling Brendan Hankard – Manager, Premium Sales and Services – later today to discuss the finer points of pimping out Fenway Park. This entry was posted in Uncategorized and tagged Brendan Hankard, EMC Club, Fenway Park, Gosling's Dark 'N Stormy Boardroom, John Updike, lyric little bandbox, Michael J. Sandel, The Atlantic, Wall Street Journal, What Isn't for Sale?. Bookmark the permalink. Don’t ask for the “Big Bat” special.